Sea of Thieves is largely a social sandbox, but up to this point you haven’t been able to make formal alliances with rival pirate crews. You could work alongside others, but you were still subject to betrayal at a moment’s notice, and sharing rewards proved difficult. 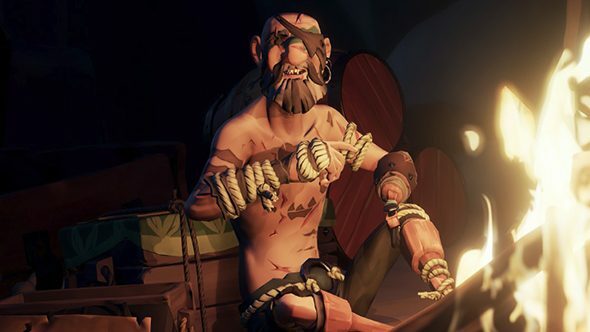 Maybe that’s just pirate life, but Rare has decided to make a more formal alliance system – and it’s coming very soon. Crews who want to form an alliance will be able to fly a pennant to signal their friendly intentions. It essentially works as an invite system, with crews able to accept or reject the pennant-based offers of friendship they receive on the seas. More crews can join the alliance as well, so it won’t just be ships pairing off. Make friends and foes alike with the best multiplayer games on PC. Allied crews all get a share of each others’ rewards, and can complete quests for one another regardless of who technically started the voyage. You’ll also be able track your alliance’s ships on the map table, and can even peek at the maps aboard rival ships to find out where every crew in that alliance is. You can see Rare recount the design process in the video below. This all cames as part of the Cursed Sails update on July 31. That update is all about battling big skeleton crews, and that should be made a bit easier thanks to the improved ability to join up with other crews. You’ll get some new lore in this week’s update, adding some more depth to the world and recounting the tales of the Hungering Deep, in addition to some more low-key fixes for bugs and stability.